To me, December is a month when I want to read fluffy, happy stories and wrap up any end-of-the-year reading projects. My preference is to spend the month with books that bring a smile to the face and do nothing to disturb my mental peace. Nothing strenuous. Happiness and joy sort of stuff. Last year I think I spent all of December reading Christmas-related titles. This year not so much. I have a stack I want to get to, of course (as usual), but it's not going to happen and I'm going to be ok with that. I did agree to read one book in particular though (and didn't mind doing so) and therefore I did carve out some time for it this past week. 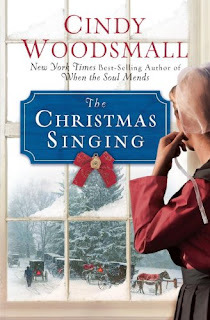 'Twas The Christmas Singing , by Cindy Woodsmall. Apparently Woodsmall has written a handful of Amish-related Christian fiction stories. I haven't read any prior to this one because a.) I hadn't actually heard of Woodsmall before; b.) you all know I'm not a huge fan of Christian fiction and am infinitely suspicious of it; and/or b.) it's about the Amish. Let me clearly state that I have nothing against the Amish. Rather, I now feel like the Christian reading world has been inundated with pieces of fiction about the Amish to the point where we are over-saturated with such titles. Too many to choose from. and they all sound the same. That sort of thing! All of the above declared, I had no objections to reading a work of Christian fiction about the Amish that has a Christmas theme. I figured if it were light and fluffy it would be welcome given this time of year. There is probably no other time during the year when this book would have been a good fit for me but in this case I was doin' fine! Let's just say that this book is everything I expected which made it a really fun Christmas read. It's full of snow, Christmas cheer, cake decorating, horses and buggies, and, of course, romance. All wrapped up in an Amish package, of course. I don't mean to trivialize the tale or make it sound silly. It's not my usual cup of tea but have I mentioned it's December? And that I like quick, happy predictability during the reading month of December? This has all the necessary elements required to cause you to sit back, relax, (possibly enjoy a bowl of peppermint ice cream) and enjoy a good, quiet read. I've no complaints and although it feels as if I don't have much to say about this book that is of much substance, I would say that it perfectly satisfied my expectations for the season and was a very fun little treat. Thank you, Waterbrook Multnomah, for sending a copy my way. I am pining for your homemade ice cream! This sounds like a fun read, I agree that sometimes light, fluffy happiness is a good read, predictable plot aside. This was one I had a hard time coming up with much to say about, but I liked it, too. I have a post in my drafts about Amish fiction - I guess just waiting til I see if I have any more to say about it. I do agree there's a glut of it right now. This sounds fun, though. I like lighter, happy stories for the holidays, too. WAIT. You have the book club reading DICKENS next December...though perfectly appropriate, I am guessing it's not light. I totally agree about Amish fiction...on all your points. The other point is that based on my Amish friends/acquaintances...not too accurate. I have a very high intolerance level for bad Amish Christian fiction, but I have to say, I'm pretty impressed with Cindy Woodsmall. A few years ago I read an entire trilogy in one weekend (those were some late nights!). I believe the series is called Sisters of the Quilt. It was good. About the only other Amish writer I enjoy is Beverly Lewis and I've only read 2 of hers. Annette, A Christmas Carol is very short. I think it's less than 100 pages. It IS Dickens but nothing like his other works. I wonder how the Amish feel about all the Amish fiction. I've never read any of it (though it has a certain appeal), but I have wondered if there are any published reactions out there by the Amish themselves. My impression -- and since I've never read any of it, this is totally untested against the actual books! -- is that the fiction sentimentalizes a way of life in a way they might look at and say, "That's not us." Mmmmm Peppermint ice cream. My favorite! I like light and fluffy every once in a while. I was just remarking to a friend that I've become much more open to reading light and fluffy in my advanced age (kidding kidding haha). For quite a long time, I would have looked down my nose at such a book. These days I'm interested. Sounds cute (positive not pejorative)!